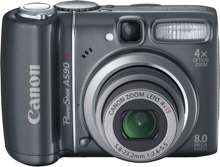 The Canon PowerShot A590 IS is an 8 megapixel point and shoot camera with a 4x optical zoom lens and image stabilization. It also comes featuring aperture and shutter priority modes as well as full manual exposure mode. It will have a retail price of $179.99 when it is released in March. Staking out the upper-middle tier of the PowerShot A-series, the new camera offers users the option of 19 shooting modes, from fully automatic to fully manual operation for greater creative control. The A590 IS camera also features Canon’s advanced Optical Image Stabilization (OIS). OIS significantly reduces the effects of camera shake (and the blurry pictures they cause) by actually allowing the lens to shift to compensate for camera movement or shake. Unlike electronic image stabilization systems that essentially mask the movement rather than actually compensating for it, Canon’s Optical “lens shift” system preserves the inherent quality of the stabilized image without covering up parts of the image. This OIS technology is even effective when the movement being stabilized is caused by extended telephoto or low-light shooting conditions.The camera’s range can be expanded even further with the use of any one of three optional converter lenses: a 1.75X tele-converter, a 0.7X wide converter and a 52mm close-up lens for eye-catching and frame-filling macro photography. The converter lenses attach over the camera’s zoom lens by means of an optional conversion lens adapter.